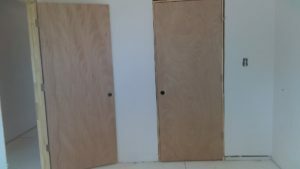 Here is the open door to the downstairs bedroom, and the closed closet door! YAY! It’s the common question I get, and the answer is “very soon.” We have hit some snags, and we have hit some bumps in the construction process (not any fault or blame to be laid, just part of the process) and we are now moving forward. The fancy cabinets have changed. A lot! My Dad is going to build the cabinets with me. It will be a project that will put a piece of him in the house that I plan to buy and live in for the rest of my life. He even has some shelving that was Mom’s that can be used. How perfect is that? 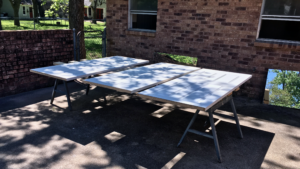 My Dad and I have done many projects together. Some have been this kind, some have been automotive. I have the little hands, so if it is a tight space, he just tells me what to do. I have felt every happy emotion you can feel since I talked to Dad about building the cabinets. So that is now handled. Next is the floors. Ugh. What to do about them there floors? 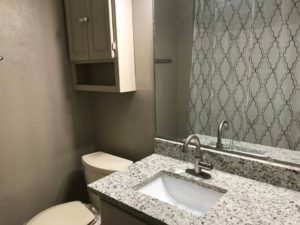 The master bathroom features granite, nice lighting, and a doorknob! 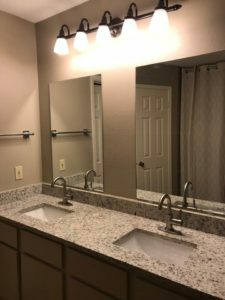 The bathrooms in the Oakridge house came out very nice, and we didn’t have to do too much other than add granite and fixtures, and repaint. What else got repainted was the doors. That’d not surprising right? It turns out to be a good idea to replace the doorknobs as soon as possible after you put the doors back up, though. Well, Carol was in the house staging away, when she had to take a “bio break.” Old habits die hard, so even though there was no one else there, she briskly shut the bathroom door behind her. No doorknob. She was trapped! Of course her phone was in the other part of the house. No amount of yelling, looking for something to trip the locking mechanism, or trying to burrow out helped. She was stuck. At least she had running water. The guest bath looks quite nice. But notice, you can’t SEE the door in the photo! Luckily, Carol is really physically fit and a strong woman. After long thought, she came up with the only possible plan. She had to kick the door down to escape! She was in much better shape than the door was when she finally emerged into the house. Ray wasn’t thrilled to have to add a door repair to the house he thought was just about wrapped up! But at least we didn’t find Carol sleeping in the bathtub days later! We’re planning an open house here for Saturday, February 17. 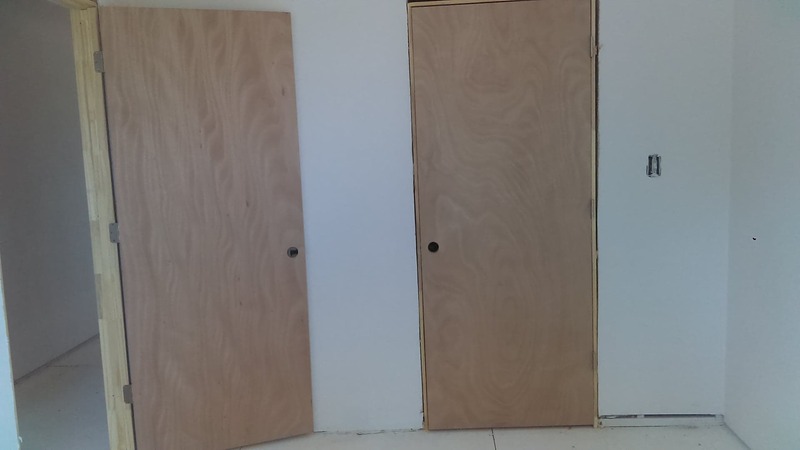 The door will look all perfect! Look here or to our Facebook page for details! Or call Carol at 512-807-8777 for a private preview.